Our Four star rated Guesthouse offers a unique experience in accommodation in four stylish units in a hidden gem closely situated to some of Port Elizabeth's most stunning beaches, major beachfront attractions, as well as the city's airport. Once settled in at the beach house, amidst the splendour of Conifer's lush gardens, it is hard to imagine that you are in such close proximity to Port Elizabeth's bustling beachfront. Exit the Airport, turn right towards the Beachfront. Drive Past the Air Force base on your right. At the traffic lights turn right towards Summerstrand. You are now in La Roche Drive. Drive past the Caltex garage on your right hand side, over the hill and down towards the sea (the sea will be in front of you).Turn left into Windermere Road, Continue straight ahead until you see a SAN REMO Apartments on the left we right next door. Take the Settlers Way turnoff, drive along the M4 Freeway towards the centre of town. Pass over the city centre, with the Harbour on your left, drive through the traffic lights towards the Beachfront, under the Apple Express Bridge and Keep left towards to Ocean, Continue to the Traffic light and over the Traffic Light and turn right into Strand Avenue come two roads up then you in Windermere Road and look to your left side and you will see Conifer Beach House next to a Big Grey Apartment Block SAN REMO. Room 1 is a twin room with a hair dryer, fridge, Dstv, fan and coffee station. Room 7 is one of the larger rooms beautifully furnished. This a double/twin with aircon, microwave, coffee station, hairdryer, and Dstv. There is a full bathroom. And a lovely private patio. 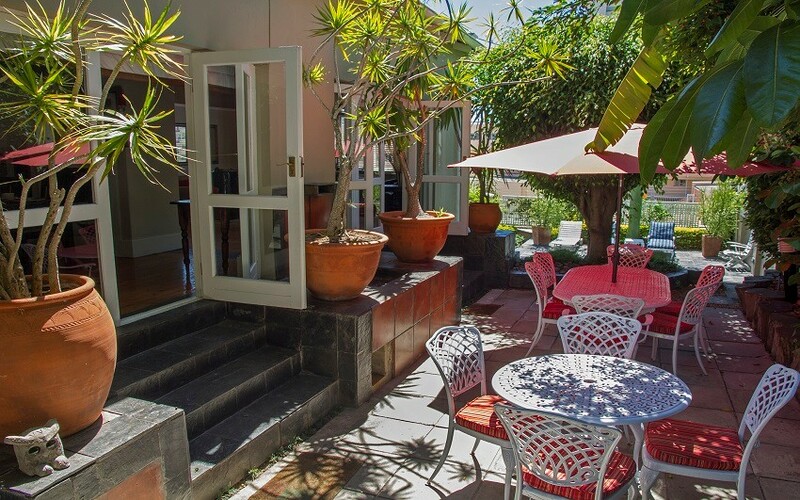 Room 2 is a luxury suite with lounge and dining area, and mini kitchenette with microwave, ,crockery fridge and coffee station, aircon, Dstv, ensuite, lovely room with outside deck and secure parking outside the door. Room 3 is a Fully self catering 2 roomed apartment, can sleep 2 adults and 2 children on a queen sized sleeper couch, separate fully equipped kitchen with dining area, aircon, Dstv, queen sized bed, lounge suite in bedroom, and full bathroom. Has interleading door to Room 4 to add another double room to the unit. This room can be used as an extra for the self catering apartment – it has 2 interleading doors from the s/c unit. It can also be a separate room with out communication with the s/c unit. The room has double bed, Dstv, fridge, coffee station, hair dryer, outside private patio and is very comfortable.